What is your opinion on Goose VPN? Getting GooseVPN to run is a simple two-step process. First, you download the VPN client straight from their website — the only prerequisite is having an account. Then, you run the file and you’re ready to go! The VPN configures itself, but you have the freedom of selecting specific protocols and server locations. You can also choose to connect automatically, and even pick favorite servers or opt for the nearest ones, based on your location. If you’re just testing the waters, there is a free trial attached to each of the packages, but keep in mind you get only 500 MB of data. You can get GooseVPN with standard credit cards (VISA, MasterCard, Maestro, American Express), or you can opt for PayPal, Giro, and iDeal instead. Cancelling the service is possible, although it was confirmed to us by GooseVPN staff that accounts exceeding 100 MB in data used are subject to review by management. We were also told that users experiencing prolonged technical issues with the VPN are usually refunded — the takeaway here is every request is treated individually by customer support, so contacting them is the first step. GooseVPN’s customer support is fast and competent. Both of our questions were answered under 30 minutes each; the instructions were clear and detailed. In addition to the options above, one can find information about the VPN or related issues in the FAQ page, neatly organized in several categories. GooseVPN also has a community forum — albeit somewhat inactive, it has a bunch of insightful threads that will surely help you out. Fast, straightforward, and dedicated to providing a top-shelf VPN experience. 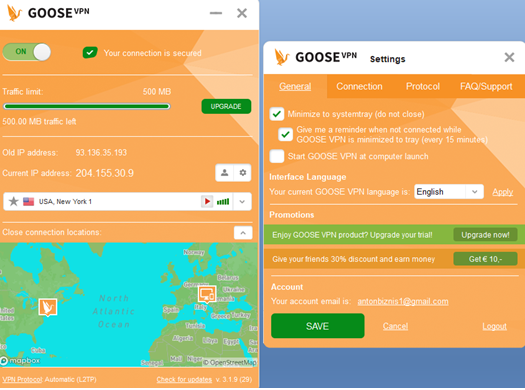 GooseVPN combines the best VPN characteristics in a neat package — immaculate privacy and accessibility, with a heavy focus on customer care to boot. Although it doesn’t bring an arsenal of servers to your disposal, this VPN is more than capable of keeping your data secure on the Internet, all while getting through geoblocks like they weren’t there. Its strict zero-logging policy ensures your information doesn’t end up in anyone’s hands, and the dedicated streaming servers guarantee access to popular platforms like Netflix, Hulu, and BBC iPlayer. There’s but one sorely missed feature — the killswitch. GooseVPN has given a rough ETA, and once it’s live, this already great provider is sure to earn a ton of new followers, or “fans”, as they like to call them. Whether you’re a seasoned VPN veteran or a newcomer making their first steps, GooseVPN is sure to meet your expectations. A respected provider, GooseVPN currently has over 83,000 users on 8 different platforms — but what makes it the favorite of many? For starters, it’s a very clean VPN. And there are a couple of meanings to this: firstly, GooseVPN earns a gold medal in the ease-of-use department. The interface is intuitive and easy to configure — if you don’t feel like tinkering about, the client is automatically set-up. Navigation is simple as well — everything is exactly where you’d expect it to be, and the various features and settings are organized in a compact manner. Secondly, performance-wise, the Goose is a reliable, no-fuss VPN. It simply gets the job done, no matter what you need out of it. It keeps you safe and anonymous with a no-logs policy and superb encrypting. It also unblocks restricted content and even has servers tailored for streaming services, which is a huge plus in our book. Speaking of servers, don’t expect to find hundreds of them here. GooseVPN has 62, but its reach is wide, covering 29 countries. As for protocols, GooseVPN offers the standard package, minus SSTP. It would be better to have the full list available, if only for various reasons, but we don’t recommend using SSTP anyway. We should note that we had to count the available locations manually within the client. GooseVPN prefers not to disclose that information publicly, and we understand them — listing your supported regions is an easy way to get your IP range blacklisted if you’re not careful. The good news is that GooseVPN’s customer support is ready to assist you with any questions you might have. We were very impressed with how our inquiries were handled — after contacting via ticket and e-mail, we heard back from support in just over 20 minutes. The answers were not only quick but exhaustive as well. Its customer support is just what users, experienced and novice alike, need — A+ there. Another strong point to GooseVPN is its fully functional free trial, but there is a 500 MB data limit. This is completely fine, as the trial is designed to give you just enough to make up your mind. Connection speed won’t be an issue with GooseVPN. Our upload/download tests yielded satisfactory results — on the desktop, there were some drops (especially when connecting to Australia from Europe), but nothing major. Mobile speeds, on the other hand, weren’t noticeably hindered, if at all. Naturally, there are some rough edges — the server variety may be a bit too stale for some, and others have expressed their discontent about the invasive orange color in the client leading to eye strain. We find it rather relaxing, but hey — to each their own. One drawback isn’t purely subjective, however. GooseVPN is currently missing a big feature — the lack of a kill switch takes quite a bit from this otherwise stellar VPN. Accidental connection drops are common, and VPN users not only expect but demand protection from such predicaments. GooseVPN is on the right track, however — it’s been stated that there is a solution in the works. All in all, GooseVPN performs extremely well and offers great value, complemented by a handy free trial and amazing customer support. Most importantly, GooseVPN proves it’s a solid long-term provider with its transparency to the user, and ambition to keep improving its service.